Communist Party USA: Go, Obama, Go! Facing the nation right now is the fiscal cliff which was set up by earlier decisions from the White House and Congress not to address longterm budget problems then. The scenario now is that without new legislation immediately on spending cuts, sought by Republicans, or more taxes, demanded by Democrats and the Communist Party USA, automatic changes will create both spending cuts and new tax liabilities. Many Washington observers say, in fact, that’s a goal for Obama, in order to allow him to blame the GOP for the nation’s ills, and for him to work on tax increases amidst the backlash from Americans facing huge new liabilities. “The national legislative struggle is the first challenge to continue the deep organizing that resulted in the election victory, in order to win priorities that benefit the 99 percent,” the party said in a statement. As part of his demands to Congress regarding a compromise to avoid the “fiscal cliff” Obama has proposed $50 billion in new stimulus spending, reports said. He also wants $1.6 trillion in new taxes and the authority to borrow what he pleases. “The will of the voters is being put to immediate test as the so-called ‘fiscal cliff’ negotiations play out in Washington. Labor and the broad alliance that re-elected President Obama clearly supported an end to tax breaks for the wealthiest and keeping hands off Social Security, Medicare, Medicaid and other basic human needs,” the party statement said. It also said the expiration of the “Bush era tax cuts for the wealthy” should be only the starting point. The comment was in a report to the Communist Party USA National Committee from the party’s chairman, Sam Webb. “We meet on the heels of an enormous people’s victory. It was a long and bitterly contested battle in which the forces of inclusive democracy came out on top. The better angels of the American people spread their wings,” he wrote in the online report. He said blacks, Hispanics and women worked together to defeat “racist … white people” and that it now is time for the Communist Party USA to work on the foundations established by Obama on issues regarding the environment, homosexual marriage and minorities to its potential. “If anything the vote … is an insistent call for action on the most pressing problems facing the working class and people. That is the election’s mandate,” he wrote. “This was not a vote in favor of destroying social programs like Social Security, Medicare, and Medicaid; or rolling back domestic spending; or resolving the budget crisis on the people’s backs. “It was instead a vote for jobs, housing relief, health care, withdrawal of our troops from Afghanistan, an end to U.S.-led wars in the Middle East, preservation of the social safety net, health care access, reproductive rights, and equal pay for women, infrastructure renewal (an issue that took on greater importance after megastorm Sandy), marriage equality, a larger commitment to public education, a tax system in which the wealthiest families and corporations pay a much larger share, reform of our punitive and anti-democratic immigration laws, a reduction in unconscionable inequality, a legislative and electoral system that isn’t awash with corporate money,” he wrote. The President Barack Obama-appointed Environmental Protection Agency regional administrator who bragged about the agency’s “crucify” oil and gas producers enforcement policy is now a full-fledged activist. The Sierra Club announced Friday that former EPA Region 6 Administrator Al Armendariz will join the staff of the environmental advocacy group in mid-July as the group’s Senior Campaign Representative for the organization’s Beyond Coal campaign. Armendariz resigned in April amid controversy stemming from a 2010 speech in which he analogized EPA’s enforcement policies to those of Roman crucifixions. Oklahoma Republican Sen. James Inhofe, who was the first to highlight the comments that lead to Armendariz’s resignation, congratulated the former EPA official on his new position. Inhofe, the ranking member of the Senate Committee on Environment and Public Works, further noted that Armendariz has followed in the footsteps of other administration activists. ATHENS (Reuters) – Greek voters enraged by economic hardship caused by the terms of an international bailout turned on ruling parties in an election on Sunday, putting the country’s future in the euro zone at risk and threatening to revive Europe’s debt crisis. The latest official results, with over 61 percent of the vote counted, showed the only two major parties supporting an EU/IMF program that keeps Greece from bankruptcy would be hard pressed to form a lasting coalition. Conservative New Democracy and Socialist PASOK, who have dominated Greece for decades, were holding less than 35 percent of the vote. That would mean they might only scrape the 151-seat threshold needed for even the most fragile majority in parliament. Once mighty PASOK looked set to be pushed into third place by the anti-bailout Left Coalition party, in a stunning vote against austerity policies that have caused deep hardship in one of Europe’s worst postwar recessions. New Democracy was polling just under 20 percent and PASOK a humiliating 13.6 percent with the Left Coalition on 16.2. In the last election in 2009, PASOK won a landslide victory with 44 percent and the Left Coalition had just 5 percent. “I cannot take it anymore, living as beggars in our own country. The Left Coalition can shake them up, and wake them up,” said Kate Savvidou, 65, a pensioner who deserted PASOK. Left Coalition leader Alexis Tsipras, at 37 Greece’s youngest political leader, hailed a peaceful revolution and said German Chancellor Angela Merkel should understand that austerity policies had been defeated. “Greek people gave a mandate for a new dawn with solidarity and justice instead of barbaric bailout measures,” he said. In another indication of the extent of public anger, the extreme right Golden Dawn party was poised to take nearly 7 percent of the vote. This would allow such a party to enter parliament for the first time since the fall of a military dictatorship in 1974. New Democracy leader Antonis Samaras called for a pro-European national salvation government that would keep Greece in the euro zone. PASOK leader Evangelos Venizelos also called for a unity government, saying his party had paid the price for handling the sovereign debt crisis. But the small parties who gained in the election are all against the bailout, while being too divided to form an alternative coalition. If the results are confirmed, the election could plunge Greece into new political turmoil, reigniting a euro zone debt crisis first detonated by Athens in 2009, and starting it down a path that could take it out of the euro. The Greek electoral shock coincided with the victory of Socialist Francois Hollande in France’s presidential election and was likely to add to pressure for resistance to German-led austerity policies. Italian technocrat Prime Minister Mario Monti, who faces increasing resistance to austerity at home, phoned Hollande and other European leaders after the election results to push for pro-growth policies. Several analysts said the unprecedented fragmentation of the vote could bode weeks of instability and force another election. But a New Democracy source said the party would not ask for repeat elections if it finished up as the largest party. Samaras is likely to be invited to try to form a government on Monday. “This election was suppose to punish major parties and if they didn’t manage to get a majority it was a punishment vote indeed,” said Blanka Kolenikova of IHS Global Insight. Greeks angry at record unemployment, collapsing businesses and steep wage cuts ignored warnings that a vote against the harsh terms of the bailout would push Greece towards bankruptcy. “The exit polls confirm what has been patently clear for some time: there’s no political consensus for the kind of reforms that Greece must implement if it wants to remain in the euro zone,” said Nicholas Spiros of Spiro Sovereign Strategy. As they voted, many Greeks expressed their rage at the parties who accepted the harsh conditions of two bailouts that have kept the country from bankruptcy. “My vote was a protest vote because they cut my pension,” said 75-year-old pensioner Kalliopi, her fists clenched in anger. “I live in a basement but pay the same (property) tax as someone who lives in a penthouse,” said Kalliopi after voting. “I voted for Left Coalition, even if this means elections again in a month. I feel vindicated, things are changing little by little because people decided to speak up,” said 22-year-old student Klelia Avgerinopoulou. International lenders and investors fear success for the small anti-bailout parties could lead to Greece reneging on the harsh terms of the program, risking a hard sovereign default and dragging the euro zone back into the worst crisis since its creation. Euro zone paymaster Germany has warned there would be “consequences” to an anti-bailout vote and the EU and IMF insist whoever wins the election must stick to austerity if they want to receive the aid that keeps Greece afloat. But many voters bitterly dismissed such threats. “I don’t think that voting for a small party will make us go bankrupt. We already are,” said 53-year-old Panagiotis, a craftsman, after voting for the conservative Independent Greeks. Greece faces an acid test as soon as next month when it must give parliamentary approval for over 11 billion euros in extra spending cuts for 2013 and 2014 in exchange for more EU/IMF aid. That looks like a tough task even if a new government can be formed in time, given the success of anti-bailout parties. Under the constitution, Greek President Karolos Papoulias will give the biggest party after the election three days to form a government. If it fails, the next largest group gets a chance and so on down the line. If they all fail, new polls would be called about three weeks later. The April jobs report, released Friday morning, found that the U.S. economy created a disappointing 115,000 jobs for the month. On several levels, the jobs report offered more of the same. Disappointingly weak job trend. The poor job market has been discouraging workers. The household survey, in which BLS calls up people and asks them about their employment status, produced several disappointing data points. The unemployment rate fell to 8.1 percent in April from 8.2 percent in March, but that’s largely because the labor force shrank by about 350,000 people in April. The labor force participation rate, the employment-to-population ratio, and the number of people who said they are employed all fell in the month. Companies rule, workers drool. A big feature of the current expansion has been that companies, empowered by access to global markets, declining unions, and a slack labor market, have been able to reap significant gains without having to share them with employees. In April, in the midst of another positive earnings season, we saw more of the same. Average hourly earnings bumped up by a single penny in the month, to $23.38. Because average hours worked stayed the same in April, wages basically stagnated. Over the past year, average annual wages have risen 1.8 percent, while average weekly wages have risen about two percent. The trend is your friend. Each month, when the Bureau of Labor Statistics reports the data, it revises the figures for the previous two months. For the last few years, BLS has tended to revise the previously reported data higher. April brought more of the same. The February jobs total, originally reported as a 227,000 gain in March, was revised to a gain of 240,000 in April. Today, BLS revised the February total up again — to an increase of 259,000. The March figure, originally reported as a gain of 120,000, was revised sharply upward — to a gain of 154,000. Add it up, and BLS discovered an additional 52,000 payroll jobs that it had missed the first time around. That might not sound like much. But 52,000 jobs at an average weekly salary of $806 is an extra $1.7 billion in monthly compensation flowing into the economy. Conservative recovery. For much of the past few years, the private sector has consistently added jobs while the public sector — state, local and federal government — has consistently cut jobs. The private sector in April created 130,000 jobs while government hacked another 15,000 jobs. The long-term trend is unavoidable and unmistakable. Since May 2010, government has reduced employment by 1.028 million. Since February 2010, the private sector has created 4.247 million jobs. The last time the government employed this few people was in June 2006. FYI: between January 2001 and January 2009, the government sector added 1.74 million jobs. Political football. The monthly jobs numbers have become a major political talking point — as well they should be. The election is only six months away. This report offers some fodder for both sides. The major presidential candidates will be asking citizens if they are better off today than they were four years ago. Plainly, the labor market isn’t. But with each passing month of gains, the question becomes a bit more complicated. In April 2012, there were 111.02 million private sector payroll jobs in the U.S. That’s higher than the 110.985 million total from January 2009. In other words, the private sector has clawed back all the jobs it shed under the Obama administration. Alas, there remains the problem of the 4.62 million jobs lost between December 2007 and January 2009. And in a nation whose population grows every month, simply treading water isn’t good enough. Taking into account the public-sector job losses, there were 572,000 fewer payroll jobs in the U.S. in April 2012 than there were in January 2009. Those who think poor jobs numbers dictate electoral destiny would be well advised to spend some time looking through the BLS Web site. When President George W. Bush entered office in January 2001, there were 132.466 million payroll jobs. In November 2004, there were 132.182 million payroll jobs. He was the first president in recent memory to be re-elected after having seen net job losses over the course of his presidential term. President Obama’s Department of Energy helped finance several green energy companies that later fell into bankruptcy — but not before the firms doled out six-figure bonuses and payouts to top executives, a Center for Public Integrity and ABC News investigation found. Take, for instance, Beacon Power Corp., the second recipient of an Energy Department loan guarantee in 2009. In March 2010, the Massachusetts energy storage company paid cash bonuses of $259,285 to three executives in part due to progress made on the $43 million energy loan, Securities and Exchange Commission records show. Last October, Beacon Power filed for Chapter 11 bankruptcy. Two months after Biden’s visit, EnerDel corporate parent Ener1 paid $725,000 in bonuses to three executives — including $450,000 to then-CEO Charles Gassenheimer, who led Biden on the tour. This January, Ener1 filed for Chapter 11 bankruptcy protection. At least two other firms that benefited from Energy Department funding — one a $500,000 grant, the other a $535 million loan guarantee — handed out hefty payouts to executives and later went bankrupt. The Department of Energy, asked about the payments examined by the Center and ABC, said it is troubled by the practice and intends to convey that message to loan recipients. The bonuses and bankruptcies come against a growing wave of trouble for companies financed with Energy Department dollars. Of the first 12 loan guarantees the department announced, for instance, two firms filed for bankruptcy, a third has faced layoffs and a fourth deal never closed. The nonprofit Citizens Against Government Waste counts nearly 20 energy companies that have gotten federal loan guarantees or grants that have run into financial trouble ranging from layoffs to losses to bankruptcies. An outside consultant hired by the White House said the Energy Department’s loan pool includes $2.7 billion in potentially risky loans and suggests the agency hire a “chief risk officer” to help minimize problems. To watchdogs, the pattern of firms awarding bonuses only to file for bankruptcy raises questions about how well the Energy Department chose its winners, and how thoroughly it kept an eye on them once selected. “Giving a bonus to the executives under these circumstances is rewarding failure with our money with no chance of getting it back,” said Leslie Paige, spokeswoman for the nonpartisan Citizens Against Government Waste. The setbacks have sharpened the focus on the president’s environmental mission, already under scrutiny following the collapse of Solyndra Inc., the first recipient of an Obama green energy loan. Solyndra, bankruptcy records show, was among the companies doling out thousands in executive payments — in its case, just months prior to its late August collapse and early September bankruptcy. As a criminal investigation and House inquiry continue into the company’s implosion, the government must navigate bankruptcy proceedings in hopes of recovering a piece of its $535 million investment. In interviews, executives with companies backed by public dollars defended the payments as proper. Some said bonuses were granted for work done in a previous year, before financial storm clouds had fully developed, and that the executive cash infusions were sometimes linked to broad corporate milestones. One company executive said the Energy Department explicitly allows for federal funds to be used to pay out executive bonuses. Secretary Steven Chu declined an interview request. The department has long defended the green energy movement as a way for government to help spur development of cutting-edge products that aid the environment and economy. Sometimes, they say, investments in potential game-changing technologies simply don’t work. The potential default rate, they say, is within the parameters set by Congress. Yet some members of Congress — already concerned about lucrative paydays at bankrupt Solyndra — say they’re particularly troubled that failed companies backed by Energy Department funds would pay bonuses at all. Bruce Kogut, director of the Sanford C. Bernstein Center for Leadership and Ethics at the Columbia Business School, said it is not uncommon for corporate bonuses to be awarded when executives meet key achievement milestones. Solyndra executives, bankruptcy records show, pocketed thousands in payments just months before the company dismissed 1,100 workers. At least 17 company executives received two sets of payments — ranging from $37,000 to $60,000 per payment — on the same days in April and July 2011. The insider payments, reported last year in the San Jose Mercury News, came as the company catapulted toward bankruptcy in early September. A Solyndra spokesman did not reply to interview requests. Solyndra’s crash last August put a sharp focus on the selection process the Energy Department follows in awarding taxpayer dollars. The administration backed the upstart firm despite concerns even from some government officials worried about Solyndra’s financial viability, email records show. And energy officials committed to the financing before all due diligence was in hand. Not as well-known are three other firms backed by Energy Department dollars — ranging from $500,000 to $118.5 million — that also suffered financial downturns. As with Solyndra, each corporate entity rewarded executives prior to its bankruptcy filing. One example: Ener1, whose subsidiary EnerDel won the $118.5 million Energy Department grant in 2009 to help expand its manufacturing plant. The company also received supportive write-ups on the DOE website. In March 2011, Gassenheimer was awarded a $450,000 bonus, SEC records show. Two other Ener1 executives pocketed bonuses of $225,000 and $50,000 for a total payout of $725,000. In January 2012, one year after Biden’s visit, Ener1 filed for bankruptcy, citing $73.9 million in assets and $90.5 million in debts. Energy officials noted that while the bonuses were paid to executives from Ener1, the government grant went to a subsidiary called EnerDel, which was not part of the bankruptcy case. But the two are closely related — bankruptcy records show EnerDel now provides all of the employees for the parent company. And the distinction is new for the Energy Department — a press release touting Biden’s visit referred to the parent company Ener1 as the recipient of administration support, not EnerDel. Gassenheimer, reached for an interview, said he could not comment. He is no longer with Ener1. A company spokesman said the bonuses were paid through Ener1, the corporate holding company, not EnerDel. DOE said the subsidiary’s project is on schedule, and an Ener1 spokesman said the battery company aims to get back on its feet through reorganization. Beacon Power’s bonuses were specifically linked to executives’ progress in landing the company’s $43 million Energy Department loan guarantee in 2009. Securing the loan was among the measures used to establish how much executives would pocket in bonuses, company SEC filings show. “The DOE loan application was approved by the credit review board, making us the first public company and the second of 16 applicants to receive the commitment,” the document notes. President and Chief Executive Officer F. William Capp received a $133,256 cash bonus in March 2010. Two other company officials pocketed combined bonuses that month of $126,029. In an interview, Capp said the company’s pay structure was reasonable and that executives took pay cuts in a bid to help Beacon Power survive. Last week regulators approved Beacon Power’s sale to an equity firm that should help it repay $25 million of the $39 million Beacon had drawn down from the loan. The company, under new ownership, plans to continue operating the 20-megawatt flywheel energy storage plant in Stephentown, New York, a project the department said would “ensure the reliable delivery of renewable energy to the electricity grid.” It hopes to build a second plant in Pennsylvania. Other energy companies struggled in the storm. Among them: SpectraWatt, a New York state manufacturer of silicon solar cells. In 2009, SpectraWatt secured a $500,000 grant from the DOE’s National Renewable Energy Laboratory Photovoltaic Technology Pre-Incubator program. In March 2010, U.S. Labor Secretary Hilda L. Solis and a local congressman toured the company’s Hudson Valley Research Park in Hopewell Junction, N.Y., highlighting the wave of coming green jobs. Yet, not long after, the company’s momentum suddenly halted. Last August, SpectraWatt filed for Chapter 11 bankruptcy protection. “It all happened so quickly,” Richard J. Haug, SpectraWatt’s President and COO, said in an interview. The company’s innovative technology, he said, butted up against changing market and pricing conditions, competition from the Chinese — and the fact that some early investors did not follow through. While the DOE’s early grant supported research and development, Haug said, a later funding request was denied. Last March, he said, the company laid off its workforce and effectively shut down. “It became increasingly difficult for us to make any more money. By the end of 2010 we basically dropped down to a cash level … that by March we would be out of business,” Haug said. In March, the big payouts began. Five company executives, including Haug, received six-figure payments in late March or early April 2011, bankruptcy records show. The five “insider payments” totaled more than $745,000. Energy officials noted that their early investment in SpectraWatt was relatively small compared to other project financing. Late last year, the company held auctions to sell off its plant and property. In recent weeks, several other companies backed by DOE dollars have encountered deep financial woes. At least six Energy Department loan and grant recipients — from electric car maker Fisker Automotive to electric-car battery maker A123 Systems to Colorado-based Abound Solar — have laid off workers or suffered financial woes. Those setbacks come on top of the companies that have already filed for bankruptcy. 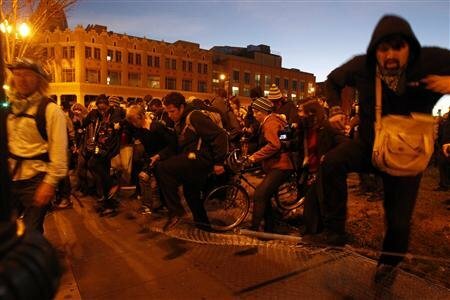 AP) — For weeks the protests had waned, with only a smattering of people taking to Oakland’s streets for occasional marches that bore little resemblance to the headline-grabbing Occupy demonstrations of last fall. Then came Saturday, which started peacefully enough — a midday rally at City Hall and a march. 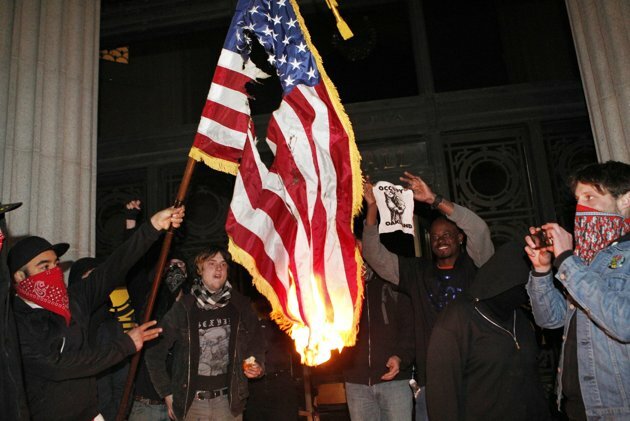 But hours later, the scene near downtown Oakland had dramatically deteriorated: clashes punctuated by rock and bottle throwing by protesters and volleys of tear gas from police, and a City Hall break-in that left glass cases smashed, graffiti spray-painted on walls and an American flag burned. More than 400 people were arrested on charges ranging from failure to disperse to vandalism, police spokesman Sgt. Jeff Thomason said. At least three officers and one protester were injured. 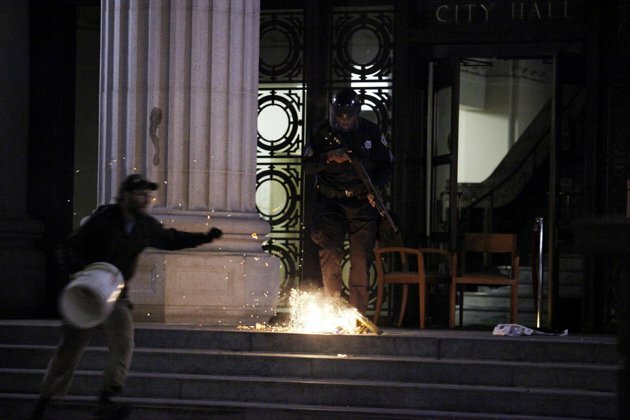 On Sunday, Oakland officials vowed to be ready if Occupy protesters try to mount another large-scale demonstration. Protesters, meanwhile, decried Saturday’s police tactics as illegal and threatened to sue. Mayor Jean Quan personally inspected damage caused by dozens of people who broke into City Hall. She said she wants a court order to keep Occupy protesters who have been arrested several times out of Oakland, which has been hit repeatedly by demonstrations that have cost the financially troubled city about $5 million. “People in the community and people in the Occupy movement have to stop making excuses for this behavior,” she said. Saturday’s protests — the most turbulent since Oakland police forcefully dismantled an Occupy encampment in November — came just days after the group announced a new round of actions. The group said it planned to use a vacant building as a social center and political hub and threatened to try to shut down the Port of Oakland for a third time, occupy the airport and take over City Hall. After the mass arrests, the Occupy Oakland Media Committee criticized the police’s conduct, saying that most of the arrests were made illegally because police failed to allow protesters to disperse, and they threatened legal action. “Contrary to their own policy, the OPD gave no option of leaving or instruction on how to depart. These arrests are completely illegal, and this will probably result in another class action lawsuit against the OPD,” a release from the group said. Deputy Police Chief Jeff Israel told reporters late Saturday that protesters gathered unlawfully and police gave them multiple verbal warnings to disband. Earlier this month, a court-appointed monitor submitted a report to a federal judge that included “serious concerns” about the department’s handling of the Occupy protests. Police officials say they were in “close contact” with the federal monitor during the latest protests. Social activism and civic unrest have long marked Oakland, a rough-edged city of nearly 400,000 across the bay from San Francisco. Beset by poverty, crime and a decades-long tense relationship between the police and the community, its streets have seen clashes between officers and protesters, including anti-draft protests in the 1960s that spilled into town from neighboring Berkeley. Before the Occupy movement spawned violence, mass arrests and two shutdowns of the Port of Oakland, the city was disrupted by a series of often-violent demonstrations over a white Bay Area Rapid Transit police officer’s fatal shooting of an unarmed black man named Oscar Grant on New Year’s Day 2009. Occupy protesters have invoked Grant’s memory, referring to the downtown plaza named after Frank Owaga, the city’s first Asian-American councilmember, by renaming the former space they occupied with tents as Oscar Grant Plaza. Police maintained a guard at City Hall overnight, and dozens of officers were on the scene Sunday. City officials said they will call for mutual aid from other police jurisdictions if needed. Quan, who faces two recall attempts, has been criticized for past police tear-gassing though she said she was not aware of the plans. On Saturday, she thought the police response was measured, adding that she has lost patience with the costly and disruptive protests. She also said she hopes prosecutors will seek a stay-away order against protesters who have been arrested multiple times. Saturday’s events began midday when a group assembled outside City Hall and marched through the streets, disrupting traffic as they threatened to take over a vacant convention center. The protesters then walked to the convention center, where some started tearing down perimeter fencing and “destroying construction equipment” by the convention center shortly before 3 p.m., police said. The number of demonstrators swelled as the day wore on, with afternoon estimates ranging up to 2,000 people, although city leaders say that figure was much closer to several hundred. A majority of the arrests came after police took scores of protesters into custody as they marched through the city’s downtown, with some entering a YMCA building, Thomason said. The national Occupy Wall Street movement, which denounces corporate excess and economic inequality, began in New York City in the fall but has been largely dormant lately. Oakland, New York and Los Angeles were among the cities with the largest and most vocal Occupy protests early on. The demonstrations ebbed after those cities used force to move out hundreds of demonstrators who had set up tent cities.